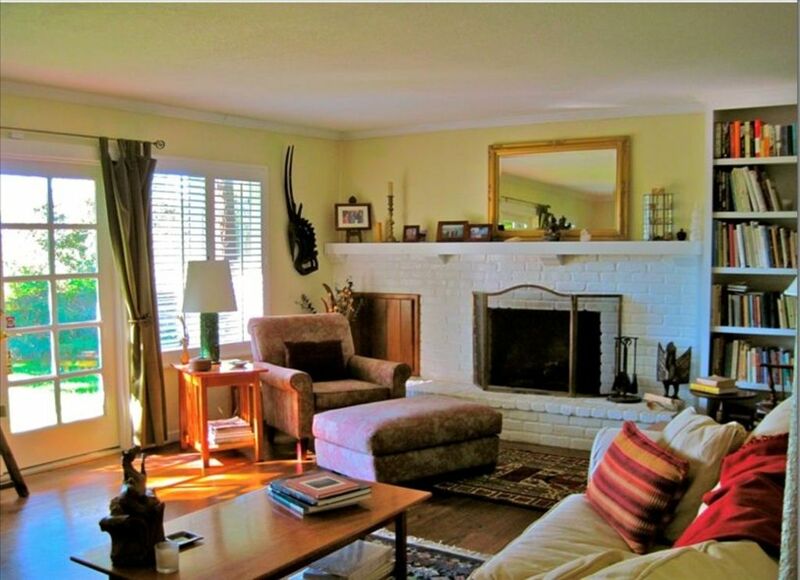 Private Healdsburg Retreat Close to Plaza , with River Access. Come home to a gated, fenced, one acre country setting, 1.5 miles from Healdsburg's charming wine country plaza. Step through the large living room French doors onto a deck that wraps around this private house with it's level fenced lawn with views across the Russian River and a sunset vista to the western hills, shaded by large Redwoods. Relax on the covered porch with peaceful fountains, large fenced private deck with Jacuzzi Spa and Weber barbecue, outdoor dining. Wi Fi in house and deck area. Enjoy the remodeled fully equipped kitchen.Two queen bedrooms, two bathrooms, (one in bedroom, other off second bedroom in hallway). Extensive gardens, orchard, hammock & outdoor comfortable seating. Enjoy the birds, flowers, and Healdsburg experience. I travel between Sayulita Mexico where I have two vacation rentals, my business, and Connecticut where my mother and family live. I feel so lucky to have the options and choices I have and wish to share them when I am not there to enjoy and appreciate them myself. This wonderful spot has been my home for the last 14 years, I have seen Healdsburg grow from a small farming community to a chic vacation spot in the best of Wine Country. I think Dry Creek, Alexander Valley and the Russian River Appellations are the best in Northern California, and I have a special spot there that I think you will enjoy as much as I do. I love enjoying the hot tub on the deck under the redwood trees, watching and listening to all the birds that visit my feeders and garden. The sound of the fountains, the perfumed air of jasmine, mock orange and other blooming flowers are very soothing and relaxing. We had the great fortune of renting Andrea's house for the month of October, and it was heaven. The yard is spectacular. Waking up to the misty views of redwoods and mountains across the vista is a memory I will always cherish. Kitchen is great. The whole house is set up perfectly to feel at home in. We hope to visit again next year! We had a very relaxing time. Everything was as expected and Andrea was very useful. We had reason to stay at this property for two months this winter. The property is very comfortable and quite inviting. It is not ultra impressive in the Ohhhhhhh sense, but is cozy and heart-warming in the ahhhhhhh sense. We would gladly stay here again in the future. My 96 year old mom, standard poodle and I were so fortunate to be able to spend two months in Andrea's beautiful home. We were so comfortable here we really didn't want to leave. We enjoyed many cool summer mornings and evenings sitting on the peaceful back deck watching the birds, squirrels and deer. We went to the plaza is the mornings to walk our dog and people watch or in the evenings we would go and have an ice cream cone from Noble Folk. Healdsburg is such a cute town and Andrea's home is in the perfect location. This is a vacation home you will not forget. We were SO comfortable in this home - perfect location and the view of the mountains was an added plus. It was so relaxing to sit out on back porch. The house was so clean. Healdsburg is an adorable town. We have been to the wine country a number of times though this was the first time that we spent a whole week there. We would most definitely stay in this home again and have already recommended it to others. photos; the yard, deck and hot-tub areas are fabulously private, beautifully furnished and well maintained. The interior is also wonderful with many different options for seating / dining. The kitchen is actually a cook's kitchen and more than fully equipped - the best "rental" kitchen we have ever been in! We will definitely be back to enjoy again! Thirty Day Min. Rental.Near downtown plaza, gated, fenced acre, ample parking, privacy, near river, golf course, bike rentals, walking distance to town. Free concerts Tuesday afternoon during the summer season. Farmer's Market. Wine tasting rooms on the plaza, great restaurant. Call for information on pets, holidays, events, availability.